Chico Creekfront Perfect Getaway in beautiful Butte Creek Canyon. 2500 sq ft home GREAT for family reunions, getaways or as a romantic retreat or stay. Swim with the salmon all summer in the deep hole off the back deck where 40-100 salmon stay from April to October when they spawn. 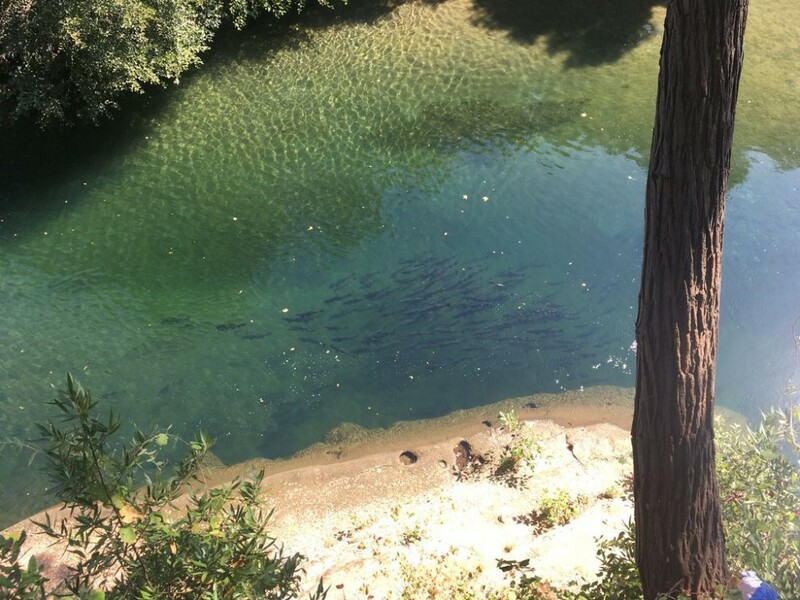 Largest wild run of Chinook Salmon in California and therefore protected from fishing. Fishing is allowed mid November and anglers have pulled dozens of steelhead when fly fishing at my place. (Catch and release at that time but very fun!) Watch the salmon jump as you enjoy dinner on the deck or use the mask & snorkle to see them up close as they flutter by you. Take the sturdy stairs that lead down to some great diving rocks. There are kayaks to rent if you wish to adventure down to the historical cover bridge. It is an easy go of it but exciting and beautiful all the same. Enjoy bird watching or get lucky to see deer, quail, turkey vultures, otters or a variety of waterfowl. Listen to the creek as you soak in the tub or enjoy the hot tub on the back deck. This is truly a perfect getaway just minutes from Chico. If you love to bike, it is a perfect 7 mile ride downhill to the 6 hole golf course or bike up for a great scenic workout. This is also a historical sight and you can learn about the diamondville area in the gold rush days at the museum just 2 miles further up. There is even a mining cave on site. A local historian who runs the Centerville museum is also master sportsman who can set up raft, hiking or kayaking excursions. Just call for details or I will provide contact information at the home. Grand Piano and guitar. Please only use if know how to play. Owner prefers echeck payments to avoid the 2% CC charge that could increase costs and it is safer in many ways. Basic Cleaning Requirements: Property must be left as found other than towel and linen cleaning which is included with your stay. Please leave used beds unmade and towels in tub or laundry room. Full refunds only available if reservation cancelled 30 days in advance and re-booked. Otherwise a $50 processing fee applies. Small Weddings or Events ($20 per person for additional guests not staying) 3 GB Wifi during stay for surfing and email (online gaming & streaming video will be charged at $15.00 per GB.) For additional guests, please contact owner at 530-354-5353. Pets are no longer allowed. Notes: Rates are based on 4 guests; add $50 per night, per additional guest. We were celebrating our son's graduation from Chico State and it was the perfect location to be out of the crowds of Chico and yet still be within a half hour of all the events. The home is very well stocked and has every amenity you would want. Our entire family attended (aunts, uncles, cousins) and it easily accommodated all of us. We spent the majority of our time on the large deck admiring the view and listening to the rush of Butte Creek. Very relaxing!!!! Our stay was wonderful! The house was very spacious and comfortable, and it´s very good located for discovering the region. Most we enjoyed the time in the jacuzzi and sit on the great terrace with a glass of wine. My son was excited of the pool billard and the piano ;-). We missed nothing. Nancy was very nice and helpful - we enjoyed the time we spend together! I just can recommend to choose this wonderful destination for a stay nearby Chico! We had a wonderful time! The house was absolutely beautiful, the view was gorgeous and the owner was more than helpful and accommodating! We played pool, soaked in the hot tub, sat in front of the fire heater with wine, and had a great nights sleep in the huge master bedroom. The house was fully furnished, including dishes, towels, blankets, games etc. We didn't have to worry about a thing! We have already booked another stay at this Perfect Getaway! We definitely recommend this to anyone looking for a cozy, relaxing and fun vacation spot! Wonderful country home just minutes from town! We loved our stay in this beautiful home! Spacious and meticulously maintained! We felt right at home! Lots of room, nicely furnished and had everything we could possible need! Nancy was great to work with and the whole process was so easy! The house was spotless and did not have any funky smells when we walked in. Loved playing billiards on the pool table, then soaking in the outdoors hot tub after a few cocktails on the deck that overlooked a peaceful creek. The location was so peaceful, but only a few minutes from Chico if we needed anything. Will definitely make plans to stay here again! Thanks for a great weekend! THE PROPERTY WAS DESCRIBED AS THE "PERFECT GETAWAY" AND IT WAS THAT AND MORE. THE BUTTE CREEK COULD BE SEEN AND HEARD DAILY AND ITS BEAUTY WAS STUNNING. THE SALMON THAT YOU SEE FROM THE DECK WERE OVER 2 FEET LONG. THE HOME HAD ALL THE STUFF WE NEEDED (AND MORE) SO GOING TO THE STORE TO GET 1 ITEM WAS NOT NEEDED. THE HOME AND DECK WERE LARGE SO A LARGE GROUP WOULD FIND IT ACCOMDATING. IT WAS CLEAN AND HAD EVERTHING YOU WOULD NEED FOR YOUR STAY. IF YOUR A HIKER,GOLFER,SITE SEEKER,BOOK READER OR JUST WANT TO SIT AROUND THIS IS THE PLACE FOR YOU. THE DOWNTOWN OF CHICO HAD LOTS OF RESTAURANTS TO CHOOSE FROM AND HAD GOOD REVIEWS. THUMBS ARE HIGH UP ON THE "PERFECT GETEWAY"! We enjoyed our stay so much, the property and location are so perfect. It rained the whole time we were there and it was so beautiful and green with amazing little waterfalls on your way up to the house. Would rent again for sure. The house was really nice and well-maintained. The kitchen had everything we needed in terms of pans etc. The only bad thing was we stayed during a huge storm so we didn't get to enjoy the outdoor area as much as we wanted to. But we would love to come back and try again! This was perfect for our family to spend time together. Beautiful home! Well equipped. Owner is very accommodating and a pleasure to deal with. Our bridal party stayed here during a wedding weekend and had a wonderful time. Thank you again for sharing you lovely home. It added to an already exciting event!